The next palliative to the Syrian crisis is likely to be a three-month old French prescription mandated by the UN and administered by Turkey: humanitarian corridors to the Syria war. 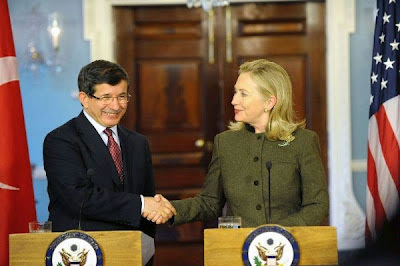 Turkish Foreign Minister Ahmet Davutoglu reveals as much in remarks to Milliyet, the major Turkish daily newspaper founded in 1950, after his extensive talks in Washington this week with Secretary of State Hillary Rodham Clinton and Defense Secretary Leon Panetta. Ankara, he tells Milliyet, is set on a two-pronged approach to the situation in Syria – one political, the other humanitarian. “In the end, we supported the Arab initiative. But Syria detached itself from its people and the Arab world. The prevailing universal impression is that the regime is relying on Russian, Chinese and Iran’s backing. “We went through the situation in Syria. First, we agreed there should be a new humanitarian initiative to reach out to people who are suffering because of shortages of food and medicine everywhere in Syria. And therefore, I spoke with the UN Secretary-General yesterday, and we started, as Turkey, an initiative with the UN Human Rights Council in Geneva, (on ways) to make this humanitarian access possible. Clinton herself told Monday’s briefing, “We will work closely with Turkey and other partners to address the growing humanitarian concerns of those who are suffering. We have heard the call of the Syrian people for help and we are committed to working to allow the entry of medical supplies, of emergency help to reach those who are wounded and dying. We are increasing our funding to organizations like the Red Crescent, the International Committee for the Red Cross, and we’re working directly with Syrian organizations at the grassroots to help families who have no electricity, food, or clean water. The frontier between Turkey's Hatay province and Syria offers the probable site for the "humanitarian corridors" first proposed by France last November. Hatay is hosting all five camps for refugees who crossed over from Syria. French Foreign Minister Alain Juppe outlined the proposal for technically and politically challenging humanitarian corridors to Syria in late November, saying they could be carved out either with or without the approval of Assad’s regime. "For us, there is no possible humanitarian aid without an international mandate," Juppe said. Humanitarian corridors to Syria and the February 24 “Friends of Syria” conference in Tunisia would fulfill two provisions of last Sunday’s Arab League resolution on the Syrian crisis. A third provision urging the UN Security Council to pass a resolution setting up a joint Arab-UN peacekeeping force for Syria is on its deathbed. Both the United States and Russia concur the peacekeeping request “will take agreement and consensus” since “there is no peace to keep in Syria” as yet.